After a 2-hour drive to the Academy in Sheffield, I arrived on a cold Friday evening to witness a band that was clearly already on the brink of massive things. It’s always good when a band plays their hometown, but from the atmosphere and anticipation on entering the venue, it was very clear that tonight was going to be very special! The venue itself was similar to a lot of other O2 venues, with the exception of the standing balcony which played a part in something spectacular later on in the set. First up was a band called SHVPES, hailing out of Birmingham, they are clearly set on dragging heavy music out of its comfort zone and taking it in entirely new directions! I’d not heard of them before tonight, although they have supported the likes of Trivium. I was instantly a fan with the clear passion and energy they put into the performances. These guys are also a band to watch out for in the future. Keep your eyes peeled. Then we had the awesome MILK TEETH, all coming out of Gloustershire. A bit more Punk, so although they’re a fantastic band, personally didn’t feel like they fit between the two bands. However, that being said, frontwoman/bassist Becky clearly enjoys being up front and milking the audience. Milk Teeth are a band who, rather than having not found their niche yet, simply refuse to settle into one. They are full of energy and promise and put on a fantastic show. The Main Event! 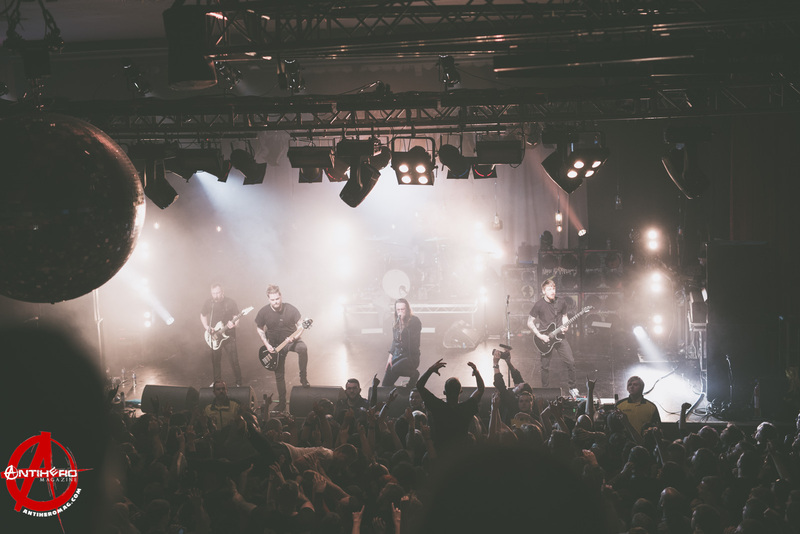 While She Sleeps! The room went black. The stage went black. You could feel the electricity in the air. I’ve never experienced a band’s home gig, but this was something else. Frontman, Lawrence Taylor, burst onto the stage with so much energy, it radiated from him, and everyone could feel it alongside the rest of the band. Opening with the title track “You Are We”, the audience had already started going crazy, with countless crowd surfers before the first song had even finished. Security in the pit had prewarned everyone that the 3rd song was going to be ‘eventful’, so if we wanted to leave we could. Eventful it was. Lawrence literally told everyone to get over the barrier! Like it wasn’t mental enough. Halfway through the set, Lawrence had made his way up on the balcony, walked around the front of the barrier then proceeded to jump into the crowd. Alongside his singing and crowd surfing, he clearly has no qualms about getting up close and personal with his fans. This is a band with talent that knows how to do things right, slowly becoming one of the UK’s most vital metal bands, pouring all the money they receive from fans straight back into the band and in turn giving the fans an insight into what makes them successful. You can see that their decision to cut ties with the record label was truly the right thing to do for the band. They are hands-on, they put the fans first and give them exactly what they want. From the minute they walked on stage to the very last minute, there was no let-up, pure musicianship, pure energy, and you can see that they love it as do the fans. This band is destined for great things, and I for one will be seeing them again.